Folks have recently been writing and commenting after lectures about a rapid field cricket song they are hearing. Most of these reports are from urban areas and a few from suburbia. During a recent singing insect workshop in southern Ohio we caught one of these gorgeous singers in the act — a Japanese Burrowing Cricket (Velarifictorus micado). They are slightly smaller than our native Fall Field Cricket (Gryllus pennsylvanicus) with pale markings on their face and very nicely patterned stripes on their hind leg femurs. Japanese Burrowing Crickets were introduced into the Washington D.C. area in 1959. From there they apparently spread to the south and have been introduced all around the Southeast, hitching a ride from nurseries as eggs in the root balls of ornamental plants. There is also evidence that some populations have developed the ability to fly. These are called macropterous individuals as they have longer than normal flight wings making them able to fly more easily and for further distances than the typical form. I have not heard any reports that this new species is displacing or harming our native field and burrowing crickets. I would love to know of any studies that are looking into this. Now, in 2011, it appears that the Japanese Burrowing Cricket is really on the move. I am hearing them just about everywhere I travel in the mid-Atlantic states. Their songs are distinctive, composed of a rapid series of chirps very reminiscent of a field cricket’s song. These rapid series of chirps can go for 6, 8, to 12 repetitions or can go on more-or-less continuously for minutes on end. Apparently, a number of people have dismissed the song as some form of native field cricket song type that they were not familiar with. Listen to the mellow chirping of the Japanese Burrowing Cricket, first inside at 77F and then outside at 72F. 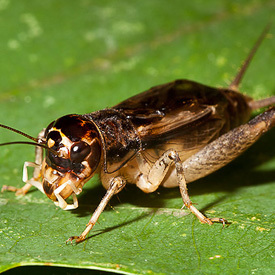 From personal experience I find that individuals that are outside tend to sing continuous trains of chirps rather than the shorter versions that the inside cricket is singing. However, one of the cricket listeners I was talking with described the shorter chirp sequence coming from his flower beds at night. Japanese burrowing cricket from Ohio singing short series of chirps followed by a longer series of chirps that was recorded outside near Shepherdstown, Jefferson Co. WV. ©Wil Hershberger August, 2011. 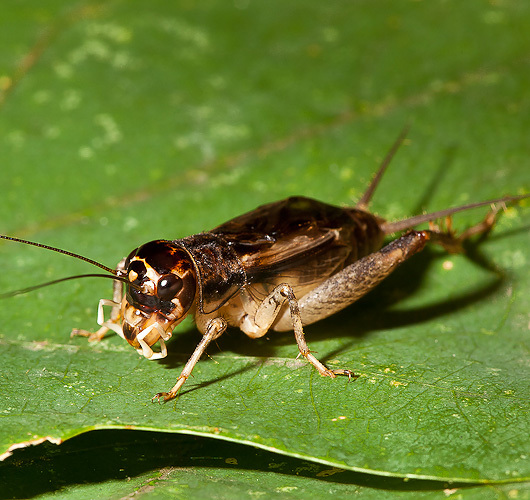 Have you heard or seen these wonderful introduced burrowing crickets in your area? I think their song is a pleasing addition to the nighttime soundscape. What do you think of their song? I’ve been doing some research on Gryllus fermus and G. pennsylvanicus. In your last comment you told me that G. fermus might be coming here. And G. fermus and G. pennsylvanicus are very hard to distinguish for me. But I’ve come up with a little hypothesis of my own and I wanted to see what you think. So let’s say there are several Field Crickets chirping, and one or two have a lower pitch than the others. Would the lower ones usually be G. fermus and the high ones usually be G. pennsylvanicus at a given temperature? Are there any other things about the chirps that help distinguish them from each other? Gryllus firmus does have a lower pitched song when compared to Gryllus pennsylvanicus at the same temperature. G. firmus also sings more rapidly, at around 2.3 chirps/sec at 24C while G. pennsylvanicus sings at around 1.5 chirps/sec at 24C. If you do recording, looking at the spectrogram of the song reveals that the individual notes (syllables) are shaped differently. G. firmus notes are lightning-bolt shaped while G. pennsylvanicus are shaped more like a comma. Comparing field recordings this way would be the best method to separate the two species. A free program, Audacity, can be used to view the spectrogram/sonogram of a sound file. Also, Raven lite from Cornell is a free program that can be used as well. I’ve still been hearing some crickets here in Three Rivers. Most of them are Allard’s Ground Crickets. There’s also been a sudden increase in temperature here in Michigan, and I’m enjoying it while I can. Here in Michigan, winter is just around the corner. What I heard last night sounded like the Burrowing Cricket in the second part of the recording. I have been hearing Jumping Bush Crickets here in Three Rivers, MI, quite a few too. Yesterday, I swear I heard a Japanese Burrowing Cricket. It sounded like a constantly calling, very fast chirping Fall Field Cricket. Hi- I’ve been hearing this species around my neighborhood in southeast Michigan (suburb of Detroit) for a few years now. It was quite a mystery for awhile –was way too fast for the field cricket–even with our recent hot nights! On another note, I wonder if the jumping bush cricket (Orocharis saltator) has been moving north. I think I’m hearing it, yet the range maps show it south of Michigan. Susanne: Yes, Jumping Bush Crickets seem to be popping up all over the place north of their supposed range. Mostly they are heard in and around cities and towns where it is likely they’ve come from afar on nursery plants. For instance, I hear them here around Ithaca, NY, which is about 200 miles north of what we thought was their range. They also occur around Syracuse and most likely most other cities in upstate New York. Thanks Will. I looked at the Northern Wood Cricket as well, but do they live in backyards in spring? Like I said it was incredibly fast and while the wood cricket seems to have a lower-pitched song, it’s almost as fast. Do you think it could be that one? Thanks. That would be a range extension to the NE of the known range but, as fast as they are spreading it certainly could be. Thanks for the information and for keeping your ears open. Thanks for the information! I live in SE NY, and in mid May last year I heard a very fast field cricket song. It could have been a Japanese Burrowing Cricket judging from how fast the song was, but it was high-pitched like a Spring Field Cricket. There had to be about three or four chirps a second. Could it have been one of these? Thanks. Yes, this year in particular seems to have shown a marked increase in the range of a number of species. I don’t know if it was the warm weather or what but we have had several species in abundance that were scarce before. It is a dynamic planet. Thanks to your introduction to this species, we’ll know to be listening up here in NE Ohio. Crickets and katydids seem to be moving northward, and we are finding species here that were recorded only in southern Ohio. Thanks for letting me know that you are hearing the Japanese burrowing cricket. Great to hear that you are getting into recording the voices of nature. Remember we are here to answer any questions that you have. Wil: I believe I have been hearing these crickets in our field lately, here 9 western Ny. I don’t remember hearing it before this year, but I just assumed it was a variation of the song of the Fall Field Cricket, as you said. Now that I’ve heard this, I’m pretty sure this is what we have. By the way, thanks for your advice on a nature recording system, I believe we’ll go ahead with it and see what I can do.